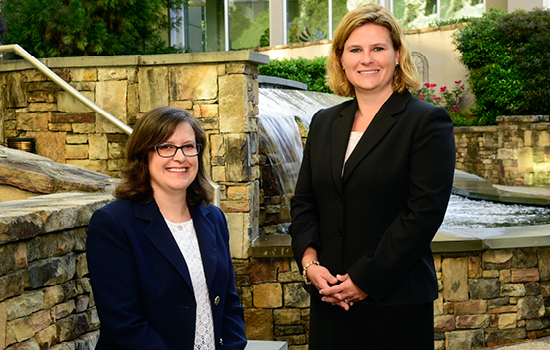 As part of its new cancer service line, Winship Cancer Institute and Emory Healthcare have made two important appointments: Melissa Childress is vice president of cancer services and Kim Slusser is vice president of cancer nursing. The Winship cancer service line will facilitate the further development of a culture of excellence in quality and service across all inter-professional cancer care teams. Childress is responsible for coordinating cancer services along with hospital and clinic leadership across multiple hospitals within Emory Healthcare. The goal is to have a Winship clinical care model that is consistent and seamless, patient and family focused, and research driven for all cancer types across all locations. Slusser is responsible for the development and oversight of Winship oncology nursing practice guidelines across Emory Healthcare to enhance the continuum of care and lead the ambulatory clinical care teams for the Emory system. She leads clinical quality, safety, outcomes, education, and oncology nursing research.